the kennedy blog: Spaghetti Squash "Pasta"
Courtesy of a girlfriend/co-worker, Emily. Enjoy! Sauce: brown ground turkey in olive oil. Combine with remaining ingredients in a large pot. Simmer for around an hour. 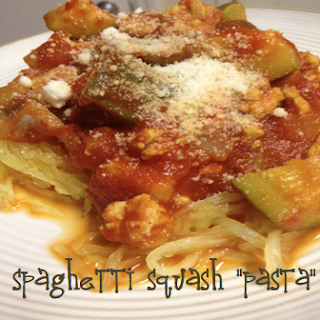 Serve over spaghetti squash. Spaghetti Squash: Cut in half, scoop out seeds & pulp, put in microwave for 15 minutes (per half). Your squash will be "volcanic hot," so be sure to remove/handle using pot holders. Using a fork, scrape the noodle-like flesh out into a bowl, serve, & enjoy. I think I saw this on Pinterest awhile back... I'm glad to hear it's really good! I'll have to try it soon!